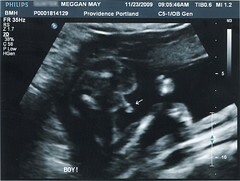 The ultrasound went really, really well. The girl was very nice and said she was an intern and would be looking at all the baby’s measurements and organs, and then her instructor would come in and take a quick look to confirm everything and answer any questions. She let me use the bathroom a couple of times, since OMG SO MUCH WATER. They have you drink 32 ounces at least an hour before you come in, and I had to pee SO BAD by the time we got there. I liked the clinic – the room was very cozy! It was nice and warm, and the ultrasound machine hand a pleasant white-noise hum, and they dimmed the lights for us. We got to see pictures of Baby’s organs, and spine, and arms and legs. It was really weird to be able to feel the baby kicking and see it on the screen at the same time. So neat! I’m measuring a couple of weeks ahead (a little over 21 weeks instead of about 19.5) but they leave it up to your doctor to adjust your due date if necessary. SQUEAL!!!!!!!!!! Congrats on your little boy! I am so happy for you. Doctors have no honest answer as to when your due date is. They are just estimating but the baby’s size & development. Your baby & your body will determine when he is ready to come out. Women have been playing this song since the dawn of time & we know it better then any doctor, lol. Yeah!!! Thanks for calling last night and letting me know! Yaaaaay! Also: I miss! you. We should stage a post-Thanksgiving hang out. With or without pie. That’s so exciting and fantastic! Congratulations!! 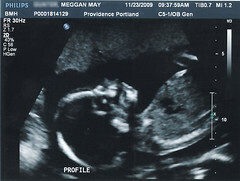 This whole time Jake has been certain that we’re going to have a boy, simply because the Luikens children are all boys. But when he heard you guys were having a boy, he said, “Maybe we’re having a girl.” I am so excited for you guys and can’t wait to see you at Christmas!